A perfect sequel to my last post Hot Hot Hot Cupcakes – here is the inspiration behind my Sun in my Pocket/Locnville cupcakes. I delivered the Ice-cream cupcakes to Lisa at the Memory Shed on Wednesday. While I was diligently and noisily scrapbooking a young girl, Carmen, came up to me and asked me if I had made the cupcakes as she needed some for her birthday party. She new exactly how many she needed and I agreed and then asked her what the theme of her party was to which she replied – Locnville. At 43 I am pleased to say yes I know who they are but it was difficult to come up with any immediate idea for cupcakes for Carmen. 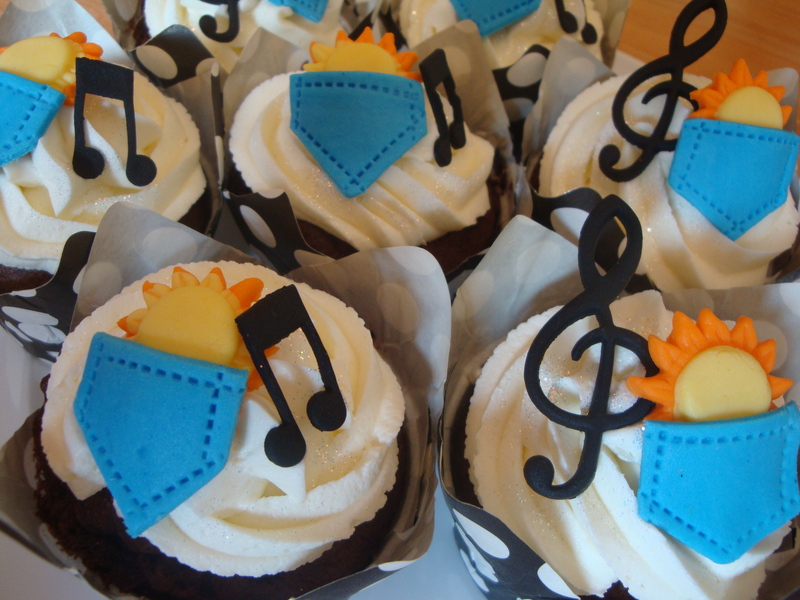 I said I would do music notes for her as she was so excited about her cupcake order and her party. Carmen I must say is definitely the most delightful client I have had so far and I was inspired to do something a little bit out of the box for this very confident 10 year old. My trusty research technique is google so off I went into cyberspace and you might have guessed it I was reminded that Locnville’s first song was “Sun in my Pocket” . I was so excited to translate this into sugar art and thought that these decorations would appeal to the joyful spirit in Carmen. I made the suns using sugar paste which I coloured yellow and orange and used a sculpey clay flexible push mold to mold them. For the pockets I coloured sugar paste a denim blue and cut out squares which I then shaped into pockets. I added the stitching detail and popped them over the suns while they were still soft. By then I was so impressed with myself I was actually humming the song to myself – not sure if I should be admitting this to you all! 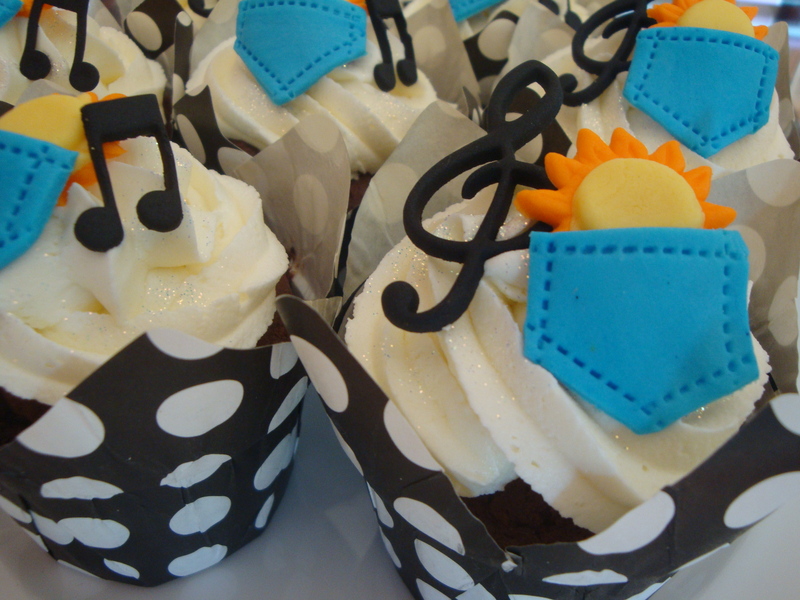 I iced chocolate cupcakes with my delicious vanilla icing and added a Locnville pocket to each cupcake along with a music note. I didn”t see Carmen when I delivered these cupcakes but I am sure her and her friends loved them today and knowing her she had a brilliant birthday celebration with her friends and was proud to give each friend a cupcake to take home. If by now you are humming this catchy Locnville tune to yourself then I will know that Carmen’s spirit has touched not only me but you guys too. 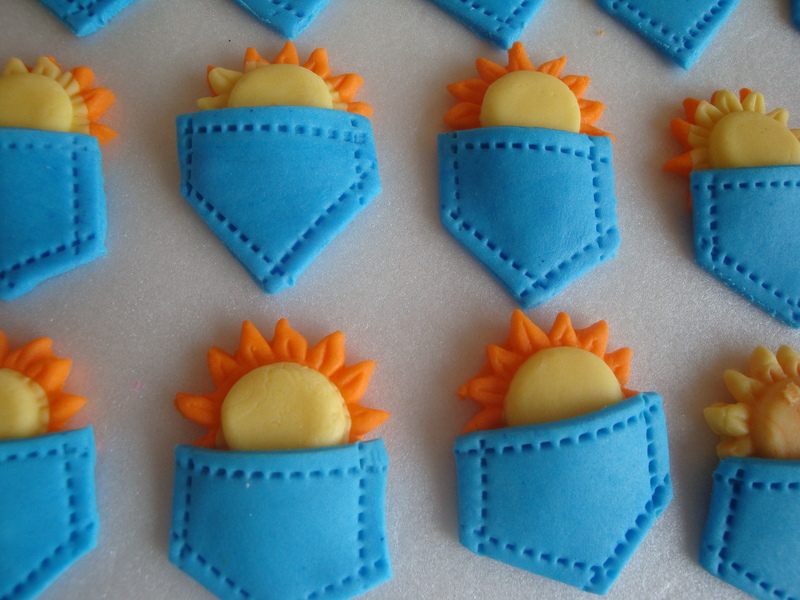 To a delightful young client it was a pleasure to meet you and do business with you and thank you for the inspiration behind these Sun in my Pocket Cupcakes and I am certain that you are a pocket full of sunshine in the lives of all around you. Thanks, I think it would be a bit too far for the cupcake to travel but the thought is a great one. She can always have a look at them on my blog!